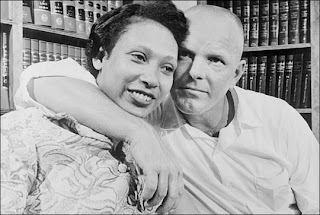 Loving v. Virginia was a watershed civil rights case in which the United States Supreme Court declared Virginia’s anti-miscegenation statute unconstitutional in 1967. A racially charged criminal trial and a heartrending love story converge in this documentary about the Lovings, an interracial couple who fell in love and married at a tumultuous social and political time in American history, yet nevertheless brought about change where previously no one else could. Through stunning archival footage of the Lovings, the film revisits this public battle through the eyes of a private couple who simply wanted to have the right to get married and live in the place they called home. More info about the film is here. Read an interview with director Nancy Buirski here. After the 5:30 p.m. screening on April 27, 2011 at SVA Theater (33 West 23rd Street, b/n 8th and 9th), the audience may join director Nancy Buirski, attorney Phil Hirschkop, Esq. (counsel for the Lovings), and Anthony Romero, Executive Director of the ACLU. They will discuss the case and contemporary issues of race and marriage equality. This entry was posted in Courts and the Judiciary, Feminism and the Arts, Feminist Legal History, Race and Racism. Bookmark the permalink.